On September 24, the Supreme Court cancelled nearly all the 218 coal blocks the central government had allocated between 1993 and 2010. The court said the allocations were arbitrary, illegal and amounted to unfair distribution of national wealth. This will hit a number of power, steel and mining companies, besides banks that have lent to these companies. Earlier, on August 25, the court had declared the allotments illegal. 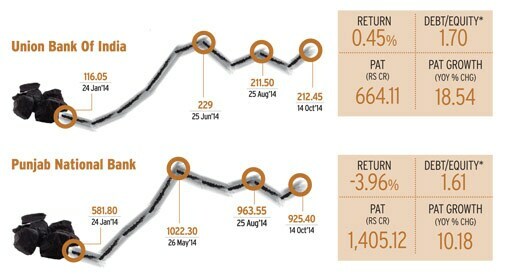 Since then, the BSE Metal index slid 9% till October 8, while BSE Power and BSE Bankex fell 4.4% and 2%, respectively. 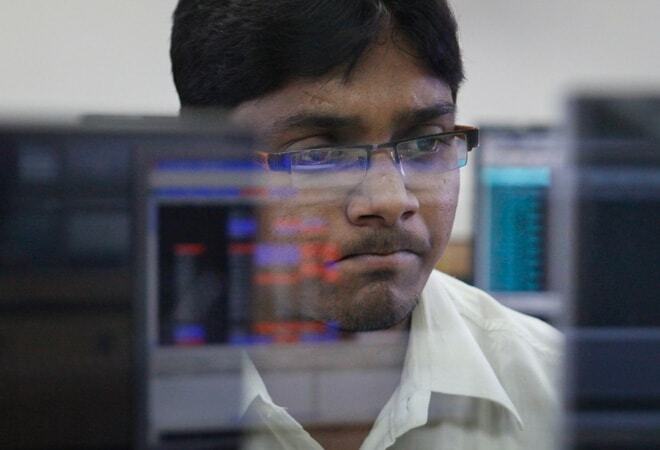 Among metal stocks, Jindal Steel and Power (JSPL) and Hindalco fell 34% and 9.6%, respectively. 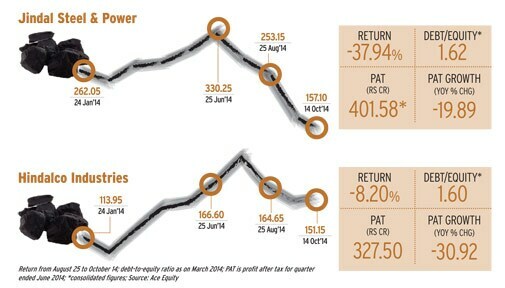 Jaiprakash Power Ventures, Bank of India and Punjab National Bank fell 22.2%, 18.6% and 8.5%, respectively. Mayuresh Joshi, VP, institution, Angel Broking, says, "The impact on banks may be severe as their exposure to coal, mining and infrastructure sectors is 6-13%. They have lent Rs 5 lakh crore to the power sector alone. The key issue for banks is exposure to second-rung companies which may find it difficult to pay interest on loans as their mines have been cancelled." Out of the 218 blocks, most were held by power companies (95), followed by iron and steel (69). A total of 41 were for commercial mining. Major listed private companies which had got coal blocks since 1993 included Jindal group (11, of which seven were for Jindal Steel and Power), Bhushan group (5), Hindalco (4) and Tata group (6). India produces 560 million tonnes (mt) coal per year. Over the last five years, incremental addition to production has been only 70 mt per year. Despite having huge coal reserves, India imports close to 200 million tonnes coal every year for its power and steel plants. Vinay Khattar, head of research, individual clients, Edelweiss Financial Services, says, "In the next one year, until the dust over the cancellation of the blocks settles, coal is expected to be in short supply." Among the blocks in question, 40 are operational and expected to produce 53 mt coal a year, around 10% of India's 2014-15 production. Although after March 2015 the mines will go to Coal India if they cannot be auctioned, the current owners, which have invested heavily in end-use plants, can get these back by bidding in the auctions. "The immediate impact of the cancellation of the 40 blocks will be felt by a clutch of companies, including JSPL and Hindalco. Jayaswal Neco Industries, Prakash Industries and Monnet Ispat will also be hit," says Khattar. Crisil Research says companies whose coal blocks are operational will see a sharp decline in profitability after 2014-15 as they will have to use imported coal, which is four times more expensive. The worst-hit is JSPL as it has the largest number of operational captive mines, which produce 12 mt coal every year. According to Kamlesh Bagmar, senior research analyst, institutional equities, Prabhudas Lilladher, JSPL will have to pay a one-time penalty of Rs 3,300 crore on its estimated production of 110 mt from inception till March 2015, equivalent to 154% and 87% of estimated net profits in 2014-15 and 2015-16, respectively. The JSPL stock has fallen 43.7% since the start of the financial year. It was at Rs 166.20 on October 8. It touched a high of Rs 340.15 on June 9. About the future of the stock, Khattar says, "Although the negatives seem to be priced in, uncertainty around future performance will not allow the stock to rise in the near future." However, Joshi of Angel Broking says, "Companies such as JSPL and Hindalco may take a one-time hit on return on equity but earnings sustainability may continue as they do not face debt servicing challenges." Hindalco, minor hit: The impact is expected to be small. The company is expected to be charged a penalty of Rs 500 crore as it has mined only 17 mt coal from the disputed mines so far. Hindalco had Rs 5,021 crore cash on the balance sheet in March. "The key issue for Hindalco will be the steep rise in cost of production at the 359-ktpa Mahan smelter due to cancellation of the Mahan captive block," says Bagmar. The court has asked Coal India to operate the cancelled coal blocks by the end of March 2015 if they cannot be auctioned till then. These are expected to produce 55 mt in 2014-15. Bagmar says, "Assuming the same level of production for 2015-16 and conservative EBITDA/tonne of Rs 300, the company's 2015-16 EBITDA and net profit are expected to get a boost of Rs 1,650 crore and Rs 1,120 crore, respectively, over our current estimate of Rs 20,700 crore and Rs 19,500 crore, respectively. These blocks could add Rs 18 per share to our current valuation of Rs 412 for Coal India." CESC, which meets a part of its coal requirement (2.8 mt for 2014-15) from the Sarshatali mine for regulated generation projects in Kolkata, will have to pay Rs 295 per tonne for around 30 mt coal mined since 2002-03, translating into an impact of Rs 900 crore. However, the management says the amount is recoverable as it is an "additional levy" and not "penalty". Still, uncertainty around the recovery of money through tariff increases persists. Also, lignite mines are excluded from the order, "We do not expect JSW Energy's lignite-based 1,080-Mw plant to be impacted. Regulated projects such as GVK's Goindwal Sahib may be allowed to pass the higher cost of coal to procurers. But other companies like GMR, Tata Power, and Adani Enterprises, which have pipelines or projects linked to the mines, will get impacted," says Khattar of Edelweiss. According to Fitch Ratings, NTPC could be more vulnerable, though the overall impact will be relatively small. Pakhri Barwadih, an NTPC mine nearing production, has been exempt. The status of nine out of 10 blocks is uncertain as it is not clear if they are also exempt owing to the fact that NTPC is a stateowned entity. The company estimates that captive mines will serve 4.3% of its coal demand in 2014-15 and 15% in 2016-17. State-run Punjab National Bank, Union Bank of India, IDBI, UCO Bank and United Bank of India also have exposure to steel and power companies affected by the Supreme Court decision. "Punjab National Bank and Union Bank of India have the highest exposure to these assets as a percentage of net worth (10-15% in 2013-14). This figure is 6-7% for State Bank of India, Bank of Baroda and Bank of India," said Nomura. Private banks like ICICI Bank and Axis Bank have not lent to the affected steelmakers but have exposure of 4-5% of net worth to power producers. According to Nomura, exposure of other private banks to these assets is relatively negligible. 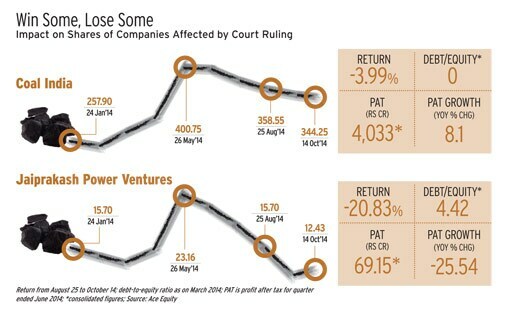 The impact on banks may be severe as their exposure to coal, mining and infra sectors is 6-13%. Advice to investors "One needs to closely monitor the developments in terms of policy on auctions and its outcome. Investors should adopt a wait and watch policy before investing in stocks affected by the ruling," says Joshi of Angel Broking.